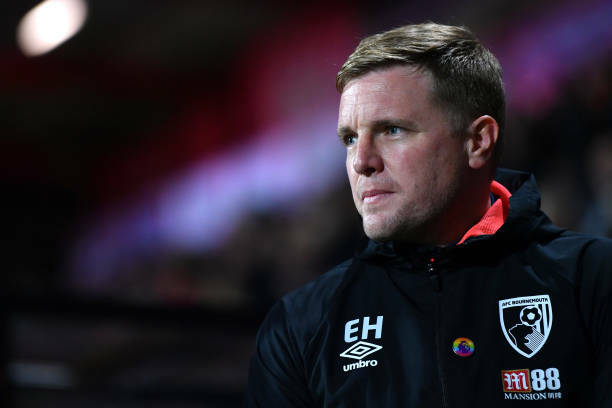 Eddie Howe praised his Bournemouth side’s as they ended a four-game losing run with a 2-1 win over Huddersfield. Bournemouth had lost to Newcastle, Manchester United, Arsenal and Manchester City in recent weeks but goals in the opening 22 minutes from Callum Wilson and Ryan Fraser got them back on track. They did have to battle for the three points after that, though, as Huddersfield came back strongly and made a game of it through Terence Kongolo’s header shortly before the break. Howe was relieved to end his side’s drought and was grateful to their fast start. “It’s a big relief, it was a very, very tough game. “We anticipated it would be, we respect Huddersfield a lot, I think they play a really good brand of football, they press really well. “We knew it was going to be tough for us, we got the ideal start, a dream start really and looked in total control at that point. “But they threw caution to the wind, put a lot of bodies forward of the ball and played very, very well, so credit to them for that. It looked like an easy evening was on the cards thanks to those early goals from Wilson and Fraser.Wilson headed home his eighth goal of the campaign, in his 15th appearance, when he was left unmarked from Fraser’s free-kick in just the fifth minute. The pair reversed their roles 17 minutes later as Wilson laid it on a plate for Fraser to roll home from the edge of the area.